This article submitted by Michael Jacobson on 7/6/00. 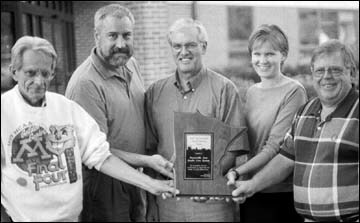 The Rural Health Team Award at the Minnesota Rural Health Conference 2000 is meant to recognize these attributes. "As I was reading the criteria for this particular award, it was just blatantly obvious that (PAHCS) met the criteria and more," explained Tom Larson, a Pharm.D. and an associate professor at the University of Minnesota's College of Pharmacology. Larson, along with another professor from the university, nominated the Paynesville Area Health Care System for this award. PAHCS won, and representatives of the system accepted the award in St. Cloud on Tuesday, June 27. Hospital system administrator Willie LaCroix (far right), hospital board members Don Anderson (far left) and Doug Ruhland (second on left), Dr. Allan Solum, M.D. (center), and Dr. Laura Odell, Pharm.D. (second on right), received the award for PAHCS at the conference. The conference is cosponsored by the Minnesota Department of Health's Office of Rural Health and Primary Care, the Minnesota Rural Health Association, the state's Rural Health Advisory Committee, the Minnesota Center for Rural Health, the University of Minnesota-Duluth Rural Health School, and the University of Minnesota Rural Health Research Center. Also at the conference, a Hero Award was given to a Rushford woman who has been active with emergency services in her community. PAHCS has a hospital, clinic, nursing home, and congregate housing for seniors at its main site in Paynesville. Within the last year, it opened the Integrated Health Center in Paynesville as well. The system also has satellite clinics in Belgrade, Eden Valley, Richmond, and Watkins. The system has eight doctors, with the newest starting practice this week, as well as several mid-level practitioners. They also have an outpatient clinic with more than 50 specialists coming on a weekly or monthly basis. "With 'Caring for Life' as their motto, PAHCS is committed to providing their patients with the finest medical programs available," Larson wrote in his nomination of PAHCS. "To this end they have established affiliations with surrounding communities and several educational institutions. Collaborative practice and educational efforts have long been a tradition with PAHCS." In his nomination, Larson cited the system's participation in the Rural Physician Associate Program, in a pharmacology program with the University of Minnesota, and with the Rural Health School. Larson said PAHCS is a national model for post-graduate training for pharmacists and was a natural selection for a Rural Health School training site because it practiced team care. PAHCS was the first rural facility to integrate pharmacy into a clinic setting, according to Larson. "Not being able to speak for other professional schools, I will note that the PAHCS experience is in high demand among pharmacy students. No other rural experience even comes close to attracting the interest of students as the PAHCS experience does," he said. Dr. Byron Crouse, the assistant dean of clinical affairs at the University of Minnesota-Duluth School of Medicine, said the Team Award is designed to recognize a team of health care providers, not just physicians, that exemplify quality, compassion, and innovation. "Paynesville is by far the leading community in the state in integrating team care and taking theory and putting it in practice," Crouse explained in a phone interview. In a time when health care is increasingly driven by money and business concerns, Crouse said PAHCS aims to do what's right for the patient. "The community of Paynesville should realize they have a really innovative, visionary (health care system)," Crouse said. "I am very proud of the Paynesville Area Health Care System," said Sen. Michelle Fischbach (R-Paynesville), who not only attended the conference, but gets health care for herself and her family through PAHCS. "The acknowledgement from the rest of the state for what we're doing in Paynesville is amazing." "They have really met the needs of the community," Fischbach added. "They are a leader in innovative ways to deliver health care." PAHCS led a session at the conference in addition to receiving their award. Fischbach introduced LaCroix, Dr. Odell, Ruhland, and Dr. Solum before they spoke on "Interdisciplinary Care: The Paynesville Success Story." Fischbach said leading a session was quite an honor in itself. Along with Commissioner of Health Jan Malcolm, who was leading a concurrent session, PAHCS's session was the most popular at its respective time. The presenters reported a packed room with some members of the audience forced to stand. Odell described interdisciplinary care, LaCroix gave the system's history, Ruhland spoke on the community impact of the system, and Solum gave a perspective from the medical staff. "It really was well received," said LaCroix. "People stayed afterwards. They kept asking us questions." LaCroix credited Odell and Solum with being leaders in the system's evolution to interdisciplinary care. Much of the system's medical staff has been recruited since the system acquired the Paynesville Medical Clinic six years ago, but Solum made the transition from a private clinic to one that is hospital-based. LaCroix said the arrival of Odell and the start of the pharmacy program in the clinic fostered the interdisciplinary approach. The needs of patients drive the interdisciplinary approach, Odell explained. Depending on the needs of a patient, a health care team is formed. Doctors, nurses, pharmacists, physical therapists, dieticians, and other health care professionals could be members of the team, which works together to form a treatment plan for the patient. The key to this approach, Odell said, is the physician may or may not be the leader of the team. "Our team is directed by the needs of the patient," she explained. LaCroix credited the doctors on the medical staff for being willing to work with this approach. "There are a lot of doctors who would not allow that to happen in their system," LaCroix said. "That's the teamwork you need, and we're a rare example." The result is the needs of the patients get addressed. "The patient gets better care in this setting," Solum explained, "because I'm more likely to send the patient down the hall to physical therapy or to the pharmacist." "Patients tell me consistently that they understand their illness now better than before we had this interdisciplinary team," said LaCroix.